This casebook is designed for use in courses on epidemiology or occupational epidemiology. The chapters are based on actual studies and are written by the principal investigators. They are divided into four parts: cohort studies, case-control and proportionate mortality studies, cross-sectional studies, and surveillance and screening studies. A brief introduction to each part describes the study design, and a statistical appendix is included so that students can easily find the tools needed to answer analytical questions in the text. Questions in each chapter deal with study design, data collection, analysis, and interpretation. Complete answers are provided at the end of each chapter. Data sets accompany many of the chapters, and most of the analytical questions can be answered with a pocket calculator. The studies presented in this lucid, well-organized text involve a broad range of disease outcomes, including spontaneous abortion, carpal tunnel syndrome, kidney dysfunction, cytogenetic changes, ischemic heart disease, dermatitis, chronic renal disease, and several types of cancer. The exposures of interest are equally diverse, including VDT use, repetitive hand-wrist motion, heavy metals, carbon monoxide, diesel exhaust, lead, vinyl chloride, pesticides, solvents, silica, and acid mists. 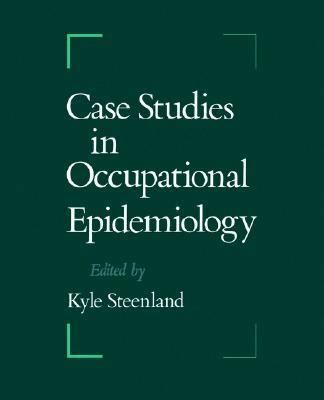 These outcomes and exposures cover many of the current topics of interest in occupational health.Steenland, Kyle is the author of 'Case Studies in Occupational Epidemiology' with ISBN 9780195068313 and ISBN 0195068319. Loading marketplace prices 149 copies from $14.97 How does the rental process work?